Agriculture is critical to achieving many Sustainable Development Goals. New research from Lund University shows that researchers, policymakers, and farmers in Europe currently have different, often conflicting, priorities for sustainable agriculture. The researchers propose a way forward built on shared priorities. "We identified precisely where the major gaps between research, policy, and practice are in terms of observable and measurable variables in sustainable agriculture. This built on previous findings that showed that gaps existed, but not where", says Murray Scown, researcher at Lund University Centre for Sustainability Studies. In the study, published in the journal Proceedings of the National Academy of Sciences (PNAS), Scown and his colleagues Klara Winkler and Kimberly Nicholas analysed the priorities given to 239 social and environmental variables potentially important for sustainable agriculture. They were identified on the basis of 69 research papers, the United Nations Sustainable Development Goals plus four EU policies, and seven agricultural sustainability assessment tools aimed at farmers. 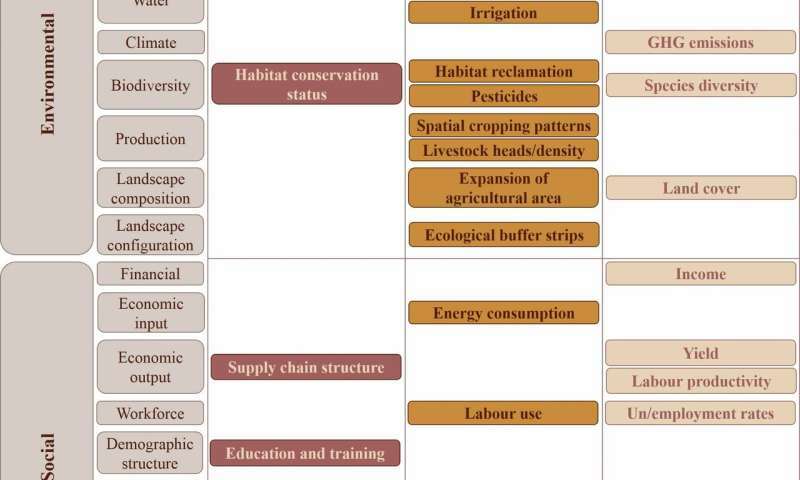 They also took a systems perspective and classified variables into their role as either drivers affecting land use, management choices made on the farm, or social or environmental outcomes. The analysis found shared consensus among researchers, policymakers, and practitioners for 32 key variables (Figure 1). There was a shared focus on drivers relating to polices on climate, environment and agriculture, as well as subsidies and land ownership; on farm management choices including tillage and use of fertilisers, irrigation, and pesticides; and on environmental outcomes including soil and biodiversity. The research team suggests these 32 variables be included in future studies and policies to make the best use of existing priorities, and that the method they developed can be used to quantitatively track progress towards the SDGs. However, the research showed that today, there is currently little alignment between research, policy, and practice for sustainable agriculture in the EU (Figure 2). 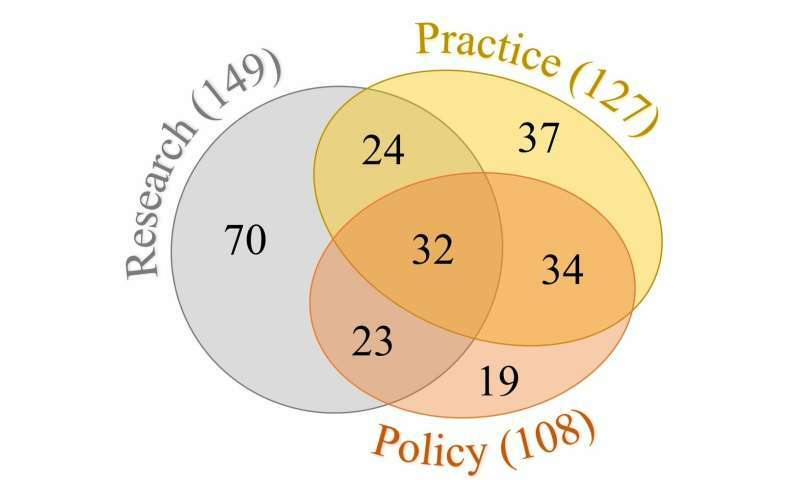 Out of the 239 variables the team identified, only 13% were shared by all three groups; more than half were only prioritised by one group (researchers, policymakers, or farmers) (Figure 2). Researchers for example focused on topography, climate, landscape configuration, and cultural aspects. These drivers were absent from policies and farm assessment tools, suggesting that they may be difficult to influence; on the other hand, these drivers might be hard to adjust precisely because of the lack of conducive policies. Policymakers focused uniquely on outcomes like pollution, livestock, physical health, and technology, whereas famers focused on income diversification and community engagement, indicating the importance of managing social outcomes of agriculture as well as environmental impacts. These social outcomes were not prioritised by either researchers or policymakers. "The social dimension of the agricultural sector appears to be very under-researched in Europe. If we look at trade-offs between different outcomes from a research perspective only, we might miss many factors that farmers and policymakers see as absolutely essential to meet the Sustainable Development Goals. This is a clear example of the need to have input from all three groups", says Scown. According to Murray Scown there are a number of explanations for the huge disparity between the three groups. Lack of communication between researchers, policymakers and farmers is one, habit is another. Researchers are trained to use and interpret data in a specific way during their academic career. "The gap we identified also has to do with the large scales at which land system research is often conducted. It's difficult to cover all variables and engage many stakeholders in research over large scales. Data availability also plays a part; variables that are easy to obtain will be used more frequently, and difficult variables will be omitted. We've tried to address this by putting together a list of social variables and potential data sources that could be used in land systems research. It's not only up to researchers to bridge the gaps. Government and statistical agencies can play a part by collecting and providing relevant data for researchers to use. A change in support by agencies that fund agricultural research and assessments is also called for. They could for example help facilitate collaborations and support workshops, discussion forums and other communication-focused activities. It can be hard to be both a researcher as well as initiating and maintaining collaborations with policymakers and farmers", says Scown. Aligning sustainability priorities between research, policymakers and farmers will be essential to achieve a more sustainable agricultural sector, according to the researchers. Yet, it is easier said than done. That is why all three groups need to give time and effort to listen to each other's views, evaluating and balancing trade-offs between priorities, and think more long-term for the future. "Our results have important take-home messages for all three groups: researchers can work more closely together with stakeholders from the start, not just at the end of a project, and policymakers and practitioners can help shape agricultural research to support achieving the Sustainable Development Goals", Scown concludes. Researchers, policymakers, and farmers should consider the 32 variables identified in this research (Figure 1) as a starting point for future research, policy, and farming decisions.